The rehabilitated wetland area. 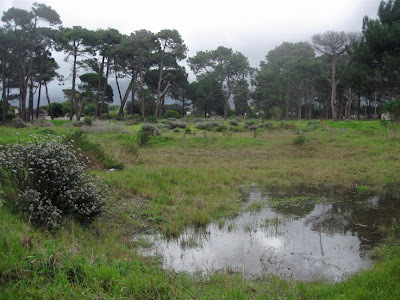 Blombos (Metalasia densa) growing on the left. 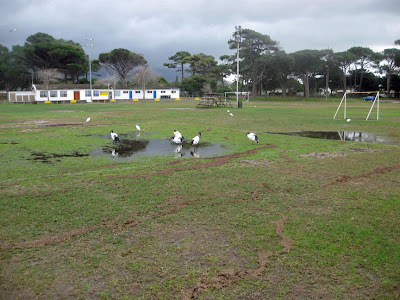 Sacred Ibis and Cattle Egrets on the flooded soccer fields. 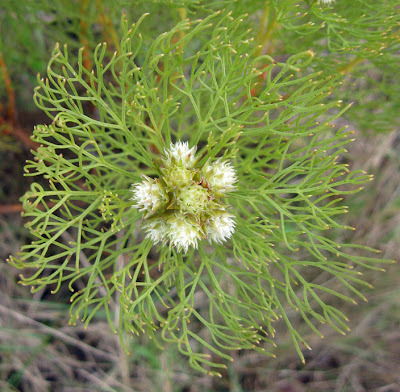 The Cluster Spiderhead (Serrurua glomerata) growing in the rehabilitated wetland area. Other flowers you can expect to find on the Common in June are Ploegtydblommetjie (Empodium plicatum), Bietou (Chrysanthemoides monilifera), Ganskos (Cotula turbinata) and Yellow Sorrel (Oxalis pes-caprae).